Free Parking is available to all participants in Parking Lot P.
The stadium is also easily accessible via SEPTA's Broad Street Line to the AT&T Station. Trains run every 8-10 minutes and it takes about 11 minutes to travel from City Hall to the AT&T Station on a local train. All Regional Rail Lines, the Market-Frankford Line, PATCO and many trolley and bus routes provide convenient connections with the Broad Street Line. Free weekend parking is available at most Regional Rail lots. You can also travel to Citizens Bank Park via SEPTA Bus Routes 4 and 17. Don't feel like driving or taking public transportation? Another option is to travel by Uber or Lyft to the stadium. check-in for their entire team to ease flow through registration. tables, t-shirt tables, "Who Do You Walk For" Ribbon Wall and other entertainment will be located. will be subject to inspection upon entry in accordance with Major League Baseball security regulations. You may bring food and non-alcoholic beverages in sealed plastic containers. Smoking is not permitted inside the Stadium. Certified service dogs or service dogs in training for guests with special needs are welcome. All other animals are prohibited. field. Field access is weather permitting so keep your fingers crossed for sun! There are no Registration Fees for the Walk to End Epilepsy — Philadelphia. 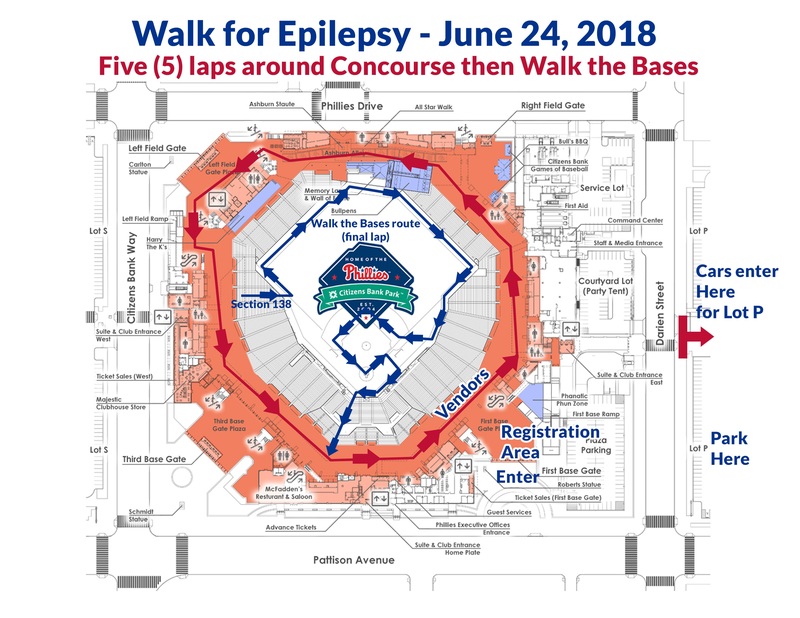 However, this is a fundraising event and all participants are encouraged to support the free programs and services of the Epilepsy Foundation Eastern PA.